The 5in5 series, from Silber Records, has been one of our favorite musical adventures this year. With the series, Silber artists record an EP of 5 tracks that total about 5 minutes in length. 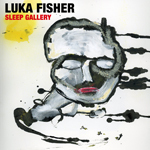 The latest installment is the EP, Sleep Gallery, ambient goodness from Luka Fisher. Fisher is generally known for his visual art & music videos, so it's pretty cool to hear what he releases himself - a mix of ambient, experimental & primitive dance reminiscent of Psychic TV & Pigface. Sleep Gallery is included in Silber Records Five in Five series, in which selected artists release five songs in five-minute EPs that explore sonic territory or approaches that they may not have freedom to do in longer releases. For Luka Fisher’s contributions, the L.A. artist exercises his musical demons through a variety of voices, including warbled, sustain synth bleeds, sample-heavy collage tracks and at least one track with tortured death metal grunts over a skittering drum machine and beautiful synth drones. Five minutes well spent. Luka Fisher is a US primitive-drone creator and better known as a video and visual art creator. As part of the Silber Records five in five series Luka released his début EP Sleep Gallery (which is available on bandcamp). For those not of longer stay, Silber Records is a label who feature regularly and the five in five series are five track EPs forming five minutes of music, split between tracks as the creator deems appropriate and demanding the musician pare everything to basics to fit the exacting running time of the release. The fourth of the five tracks is As You Slip Away – a piece resonating of the wildest nightmares.